William Fitzsimmons, Dean of Admissions and Financial Aid at Harvard. 1. Get Involved. Join a student club, participate in student events. This is a sure fire way to help with your college experience. Studies show students who are active in their university do 20 percent better on their overall grades. You can also learn a lot from student events, which you usually pay for as part of your tuition but many students tend to ignore. Many schools host a variety of parties, festivals and concerts but also guest lecturers and more. It’s your dollar -- use it to its fullest and get a rich college experience that's not only about academics. 2. Ask questions. Many students get caught up and overwhelmed just because they don’t understand something, or are unsure where something is. It’s okay to ask and talk to your fellow students or your professors. They are there to help you graduate. Many schools offer tutoring services, counseling services and career services to help you along the way. In the end, it’s better for the university for you to graduate on time so they provide the services to help you achieve that goal. 3. There are opportunities. Many schools have a ton of opportunities that don’t get used by students. There are scholarships, trips, internships, and other awesome opportunities lying on the ground waiting for you to pick them up. Well not literally, but you get the idea. Some take a short essay to enter, others just require you to sign up. Take time to check your student email, or look at the student bulletin boards around campus. You never know what you can find. 4. Find your OWN place. All students worry about fitting in and belonging when they get to college. Keep trying new things, and eventually you'll come to feel at home! 5. Go to class. Hey, we know that college is different from high school. Professors aren't likely to send out direct punitive actions for missing their class, but your grade will reflect your absence. Communicate with faculty if you can't be there. 6. Get to know your advisor. Don't be afraid to talk with your professors. They enjoy getting to know their students and are there to help. They're not as scary as you think. Choosing a college can be confusing. Here's a scorecard that rates how W.Va.'s public colleges compare with other public schools across the country. Music in this show was provided by Jake Schepps, Michael Howard, and Darlingside with "God of Loss" as heard on Mountain Stage. 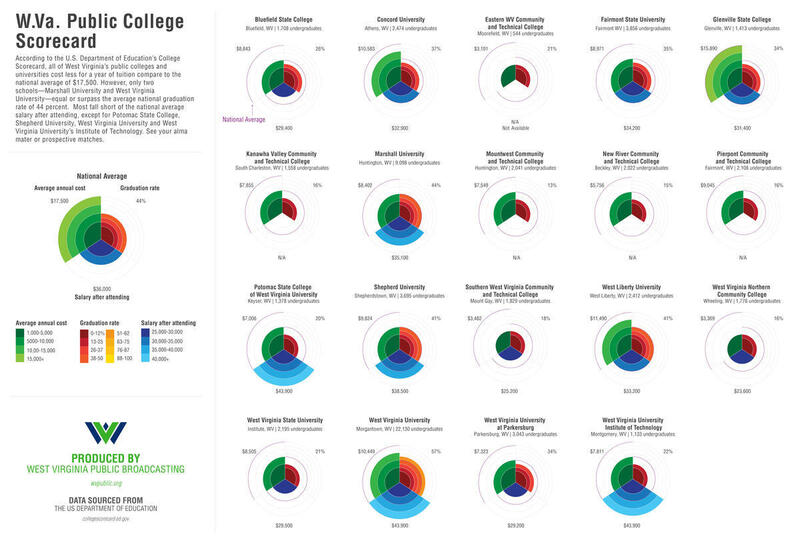 Infographic - Are W.Va. Public Colleges a Good Value? 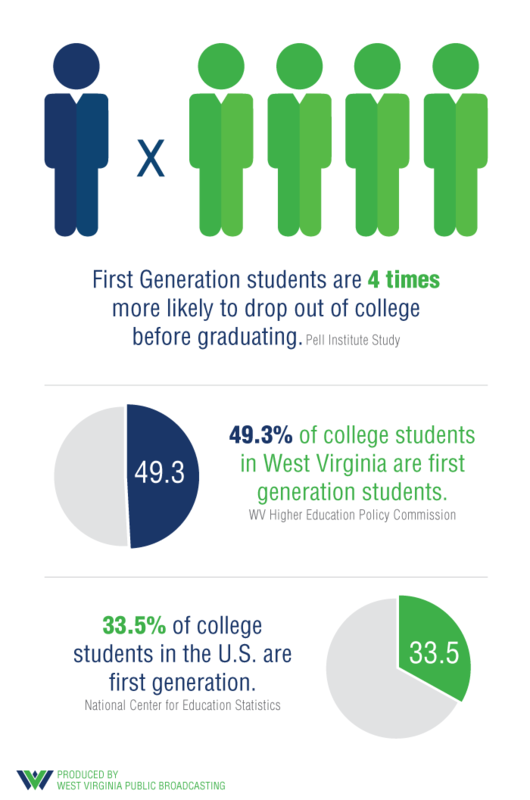 According to the U.S. Department of Education's College Scorecard, every public college and university in West Virginia costs less to attend than the national average of $17,500. However, only 4 schools meet or exceed the national earning power after attending. Shepherd University, West Virginia University, and two WVU-affiliated schools, (Potomac State College and WVU Institute of Technology) exceed the average national salary of $36,000; salary information was unreported for several state schools. West Virginia University's governing board has responded to a wrongful death lawsuit brought by the family of a student who died following a hazing for a fraternity that had its charter revoked.